How Can We Inspire Health? If one question caught my attention and summed up my thoughts from the Weitzman Symposium last week, it was Jay Parkinson’s question, “How Can We Inspire Health?” It was a brilliant exploration of the topic. But the symposium is now over and we need to get back to work; moving beyond thinking about the questions to acting upon them. That is what happened Saturday at our Day Street Community Health Center in Norwalk. There is more to health than a patient listening to a doctor during a routine visit once or twice a year. Health is a way of life. 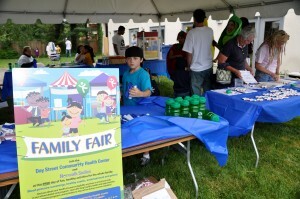 For those of us who work with community health centers, we understand that it is intimately linked with the community, and the Family Fair in Norwalk illustrated that quite well. Although the weather was rainy, it didn’t dampen the spirit of those who came to help. Joining the stalwart AmeriCorps members who add so much to so many of our events were volunteers from GE’s Developing Health Initiative for Fairfield County. Last December, The GE Foundation donated $1.25 million to community health centers in Fairfield County, including $250,000 to our facility in Norwalk and another $250,000 to our facility in Danbury. 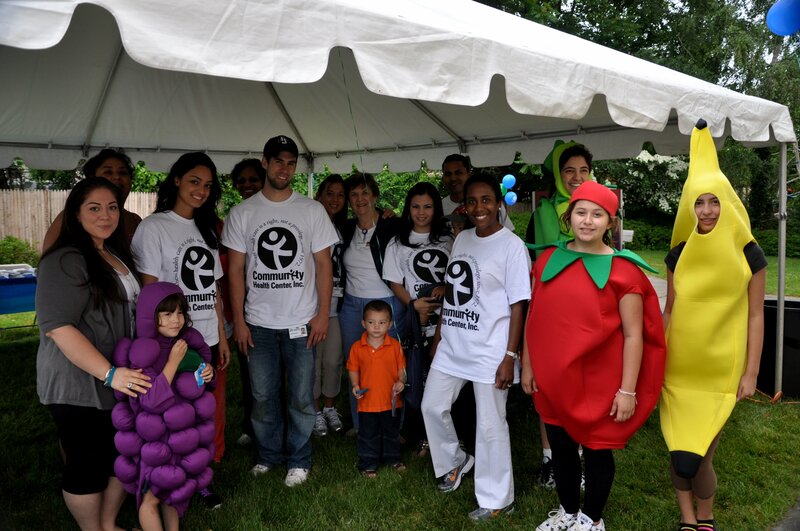 Yet what is really important is the volunteers from GE that come and help with events like this; it is an illustration of communities inspiring health, the way Dr. Parkinson spoke about at the Weitzman Symposium. They helped set-up, and managed the “Refreshments” and “Welcome Desk” table. They spoke to many children and parents that entered the fair. They gave out CHC gifts and they assisted with handing out healthy snacks which included: Fruits, fruit snacks, pretzels, water bottles, and popcorn. David Guggenheim, Behavioral Health Director for Fairfield County, participated in the race with the kids. Yesica Acevedo, Norwalk Receptionist, did an amazing job with the Face painting table. Llara Perez, Access to Care, provided information regarding HUSKY and Early Detection. Mary Calka, Dental Hygienist, Provided information regarding Mobile Dental Registrations and Kindergarten Registrations. Diana Revolus, Medical Assistant for Norwalk gave blood pressure screenings to some of the parents. 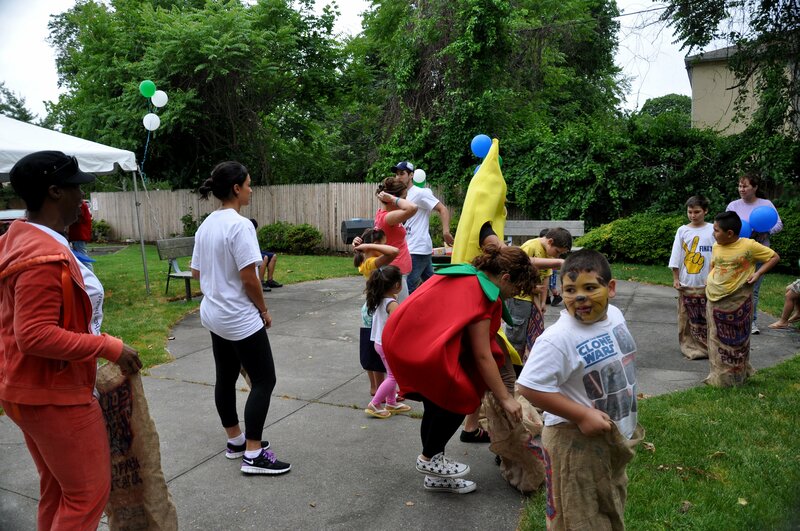 Deb Faria, Danbury Behavioral Health Clinician, dressed up in Fruit and Veggie costumes with her daughters. They played games, danced, and promoted healthy eating to the children. How do we inspire health? The GE volunteers, CHC Staff and AmeriCorps members who participated in the Family Fair at the Day Street Community Health Center, provided a good example. What if Leopold Bloom worked at a Community Health Center? I loved the posting about the fair. So much time and effort went into planning the event. Day Street CHC did a fabulous job and what a great contribution the GE volunteers made. Angelica Camacho’s effort was amazing! Hopefully next year the weather will cooperate more.